and their first playoff appearance since 1992. The Pittsburgh Pirates will be hosting their first playoff game since the 1992 NLCS Tuesday night as they entertain NL Central rival Cincinnati at PNC Park. The Pirates had not only missed the playoffs since 1992, they never finished above .500 during the span. So, this game is something that Pirates fans have waited a long time for--the chance to cheer on their team in a playoff matchup. Say what you will about this being the wild card play-in game--it is the postseason nonetheless. The play-in game brings its own craziness to baseball, as the winner advances to the "more meaningful" National League Division Series to face the NL Central Champion St. Louis Cardinals. The Pirates finally turned the corner in 2013. They had successive seasons in 2011 and 2012 in which they flirted with .500 baseball and slumped off as the season extended into August and September. This season they built a big enough cushion to withstand a 24-24 finish over the last 48 games, concluding the season at 94-68. The Bucs will have their hands full with the Reds. 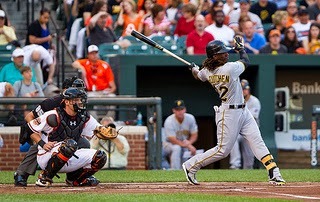 The teams were fairly evenly matched with the Pirates winning 11 of 19 games between them this season, including a three-game sweep at Great American Ballpark to conclude the regular season. The Reds (90-72) will have revenge on the brain and look to ace Johnny Cueto to provide his veteran presence on the mound. Cueto’s season was marred with injuries, tossing only 60.2 innings on the year. He just returned from the disabled list in mid-September, but has looked sharp in two appearances. He did face the Pirates twice in 2013 and allowed just one run and three hits covering 12 1/3 innings. His Dominican counterpart, Francisco Liriano, had an absolutely magnificent regular season. The Pirates took a flyer on the soon to be 30-year-old lefty this offseason and it paid off. Liriano finished the season with a 16-8 record and a 3.02 ERAin 161 innings, harkening the days when he was projected to be a star with the Minnesota Twins. He was dominant at PNC Park in 2013, going 8-1 with a 1.47 ERA. Cueto is flanked by a fairly potent offense. The Reds ranked third in the NL in runs scored behind Shin-Soo Choo (.885 OPS, 107 runs, 21 HR and 20 SB), Joey Votto (.926 OPS, 101 runs and 24 HR), Brandon Phillips (103 RBI) and Jay Bruce (30 HR and 109 RBI). Liriano will be backed by MVP candidate Andrew McCutchen (.317/.404/.508, 24 HR and 28 SB), Starling Marte (.784 OPS and 41 SB), Pedro Alvarez (36 HR and 100 RBIs) and Russell Martin provides support behind the plate. This matchup should be tight and could come down to which team pitches better in the late innings and both clubs have top flight relievers at the back end. The Reds feature fireballer Aroldis Chapman (38 saves), while the Pirates received great efforts from Mark Melancon and Jason Grilli who combined for 49 saves. The way I see it, the Pirates will stage a late rally around their fans, in one of the best places to watch a ballgame and eek one out over the Reds and head to St. Louis for the NLDS.